But an attempt to recover the booster's first stage ended in failure when a hydraulic system malfunction caused the booster to rapidly spin and tilt about its long axis during its final descent. As a result, the rocket landed well off target, settling to a gentle, upright "landing" in the Atlantic Ocean just east of the launch site. The rocket then tilted over, splashing down horizontally and remaining intact. SpaceX founder Elon Musk tweeted that the hydraulic problem affected the movement of the rocket's four titanium "grid fins," used for steering and to maintain orientation as the booster drops tail first back to Earth. "Pump is single string," Musk tweeted, meaning the system does not have a backup. "Some landing systems are not redundant, as landing is considered ground safety critical, but not mission critical. Given this event, we will likely add a backup pump & lines." A few minutes later, he tweeted video captured by a camera on board the rocket. "Engines stabilized rocket spin just in time, enabling an intact landing in water! Ships en route to rescue Falcon," he said. It was SpaceX's sixth outright landing failure and the first since June 2016, ending a string of 27 successful recoveries. The company's overall record stands at 32 successful recoveries: 11 at the Cape Canaveral Air Force Station, one at Vandenberg Air Force Base in California and 20 on off-shore droneships. Video posted on YouTube shows the booster dropping back down to Earth and then tilting over. The new "block 5" Falcon 9 stages are designed fly dozens of times with minimal refurbishment between launchings, a key element in the company's drive to lower launch costs by recovering and re-flying recovered stages. 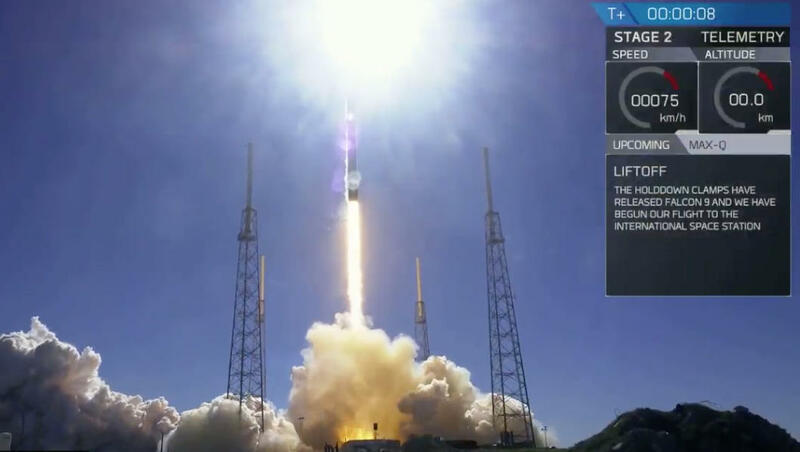 The stage launched Monday from California was making its third flight, a first for SpaceX. But the rocket launched Wednesday from Cape Canaveral was brand new. It's not yet clear what went wrong with the grid fin or whether the mishap will prompt the Air Force to reconsider SpaceX's clearance to land at the Air Force station. But the landing system is designed with the safety of personnel and ground facilities in mind. The rocket's guidance system initially targets an off-shore "impact point" and only moves the target on shore to the landing pad during a final rocket firing and only after verifying all systems are operating properly. During Wednesday's landing, the flight computer recognized the grid fin problem and never moved the impact point ashore during the final engine firing. "The important point here is we have a safety function on board that makes sure the vehicle does not go on land until everything is OK, and that worked perfectly," Hans Koenisgman, SpacerX vice president of build and flight reliability, told reporters. "The vehicle kept well away from anything where it could pose even the slightest risk to population or property. "Public safety was well protected here," he added. "As much as we are disappointed in this landing, or landing in the water, it shows the system overall knows how to recover from certain malfunctions." Long-range tracking cameras provided spectacular views as the stage dropped tail first toward Cape Canaveral. But television views from a camera mounted on the rocket suddenly showed it rotating roughly about it's long axis. The rocket's center engine started as usual for landing, and the booster's landing legs deployed at low altitude as they would in a normal landing. Interestingly, the landing leg deployment seems to have slowed down the rocket's rotation just before impact in the ocean. While the landing was unsuccessful, the primary goal of Wednesday's mission was to deliver the Dragon cargo ship to the proper orbit. And the Falcon 9 did just that. If all goes well, the spacecraft will reach the station Saturday morning, pulling up to within about 30 feet and then standing by while station commander Alexander Gerst, operating the lab's robot arm, locks onto a grapple fixture. Flight controllers at the Johnson Space Center in Houston will take over at that point, operating the arm by remote control to pull the Dragon in for berthing at the Earth-facing port of the station's forward Harmony module. In late August, sensors detected a small pressure drop in the station's air supply that was traced to a leak in the upper habitation module of the Soyuz MS-09 vehicle. An inspection revealed what looked like a small hole drilled into an interior panel. While the hole appeared to be the result of deliberate action on someone's part, presumably before launch, the Russians have not yet revealed any conclusions.